Choti was one of the slaves who rebelled. The villagers had begun meeting with organizers from Sankalp, a grassroots NGO that has so far helped 4000 slaves to free themselves from slavery in the stone quarries of Uttar Pradesh. 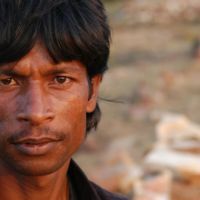 Seeyawati, who works for Sankalp, explained that organizers offered the villagers two things initially: “an example of another village where we’d been able to get some progress done,” and the question: “how long could they live this life as a slave?” Bala, who also works for Sankalp, added: “Earlier on there was no hope at all amongst the people. They didn’t believe they could be free. We gave them a new hope, and said to them: ‘What has happened has happened. The past is past. But it’s up to you to make a change, because it’s your life and the lives of your children.’” The slaves began to organize. Women were particularly central to this process of self-liberation, as Bala explained: “When one of the slave owners came to a house and raped a man’s wife, 15 females came out of their houses and said ‘No more,’ formed their own self-help group and joined us in the movement.” The narratives focus on the role of women in the process of self-liberation: Choti observes that the women “played a very big role in getting revolution. My name is Choti. I think I’m about 20 years old. When I was getting married, I took a loan from the slave owners. At that point I ended up becoming a bonded laborer. Before my marriage I was not a slave. I was free. I would work in the fields, but I was a field worker. I think I got a loan of about 5000 rupees [$100], for ceremonies, the guests, the miscellaneous expenses of my marriage. But I took 5000 and I repaid 10,000 [$200] for a long, long time. From the time when my kids were tiny to the time when they could work, that’s the amount of time I was a bonded laborer. I would go back and ask them: “Is the debt over? Have I repaid it all?” They would say: “No, no, now it increased. It was 10,000. Now it is 20,000.” Then: “No, no it is not 20,000 anymore, now it is 30,000.” I was not earning anything. I was barely earning some grain, some rice. How was I to repay the loan? I had no idea. This carried on and carried on and carried on. Life was very tough. I was made to work in the fields the whole day, whether the children were crying or not, or when anyone was sick. I was not allowed to go home. Every single day, for long hours, I was expected to be working very hard. Not only were we made to work in the fields, we were also made to work in the stone quarry, to break up the stones and make them into tiny pieces. For all our effort we were hardly paid. Once the breaking of stones was over, we were also forced to lift them up and load them onto the truck. I was very scared of the slave owners because they would issue directions: “Go and work here. Go break the stones.” You could not refuse because the next step was: “I’ll burn your house.” That’s it, every day. The threat was so strong, and I knew they could carry it out. Therefore I had no choice. We had to go and work. Life under the slave owners was complete hell. The females were especially harassed. The men would go off to work, either to the fields or the stone quarries, and the slave owners would come to our house, show us a huge knife and compel us to work. If you would refuse, saying the males had already gone, they would just drag us by the hair and compel us to work. Things got so bad that when the slave owners came to one woman’s house and she refused, he had a huge knife and he just killed her. We never knew when a tractor would come and just drive over us and kill us. And once in the night, the contractor came to a woman’s house and raped her. There were no rights, nothing. One day a girl had gone to work in the fields and when she came back, the contractor wanted to misbehave with her. She tried running away and as she was running he burned down her house. He burned down a lot of houses and a girl was burnt right inside. They burned our houses, our food, our clothes. Everything was burned down. It seemed certain that they would lock us inside the house and burn us. They almost did. Sacks of grain were burned, everything was completely destroyed. We had to run away. Not a thing was left, everything was gone, completely evaporated. We had to all come out and move to a village. We were left to live below plastic sheets. No walls, no roof, nothing. It was very tough. That’s what we had come down to. The basic utensils weren’t there, the utensils on which we cook chapati weren’t there. Nothing. The night that the houses burned down, not only were my eyes weeping, my very soul was torn, shattered. We saw crying and wailing. It was sheer agony. My husband was in prison and my son died during that time. But I did think things would get better because the interaction with Sankalp had begun. So I knew there was a ray of hope. There was an expectation that something would give and change would come about. My children were homeless. But something was going to happen. I knew it. The females played a very big role in getting revolution. When we had initial meetings with the local authorities and with Sankalp, they told us to coordinate with each other. That didn’t mean very much to us at that point. But slowly, when we had a couple of meetings here and a couple of meetings there, things began to sink in, and we came to realize we were doing all the work. We are the ones who are cutting the stones, we are the ones loading the lorries every single day and not getting any assistance or any monetary benefit. That’s when we all met the Sankalp members and took action into our hands. Initially when Sankalp would come down to the village and interact with us, the contractors did not like the idea: “You motherfuckers,” is what they would scream at us, “What are you doing?” So on and so forth. Seeing this just got our enthusiasm more aroused, and that’s when we started taking Sankalp more seriously. 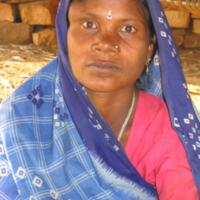 The Sankalp people said: “Look, you have food that you grow yourself, you have labor that you do by yourself.” They made us aware of the fact that it was possible for us to be self-sufficient, for us to be able to sell and buy our own food grains, for us to be able to educate our children. They made us realize that we were exploited and that we were under the control of the slave owners. We knew that, of course. We were aware that there was an evil person who would come and beat us up, but they made us aware there was something we could do about it, that it was possible for us to get together move toward the cities and the towns and then bring about a revolution. The Sankalp people helped us a lot after the burning. They came together and gave us a vessel on which to cook our food, they gave us medical help and assistance for our children. I love my life now. I just simply love it. My children are going to school. I have food in my stomach. Ever since I held the hand of Sankalp, I love my life. There is so much happening in it now, so many good things. I’ve got a lease on a house, I’m free, there’s education, my children are happy, I’m happy. My dream for my children is that they grow up, they become people who can read, who can write, who can live in the cities and have a job. They shouldn’t be like us, any of us. They should not be working to break stones, they should not be dying like we do, day in and day out, under the hot sun. They should be people who live a life in the cities, big people. That’s my dream. I have five kids and I don’t work now. Before, when my children woke up, they would be rubbing their eyes and I would be far, far away in some field, working under the slave owners. Now I don’t work. I get up, I feed my kids and send them to school. They come back. I relax in the afternoon. In the evening I make sure they’re okay. You know, a regular wife. That’s what I do now. That’s my life. All I want is that nobody remains bonded anymore. That every child is free, free to study, free to learn, free to live their own life.